Please contact us regarding your enquiry and one of our experienced surveyors will be pleased to consult and discuss your liquid roofing project with you. HBS Liquid Roofing is an approved installer of the leading brands of liquid roofing products. 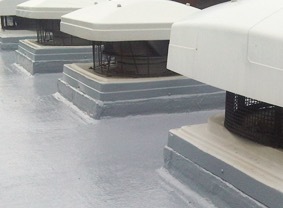 We deliver successful roofing projects to the commercial, industrial, public and healthcare sectors throughout the UK. As an independent installer, our underlying philosophy is to offer the most suitable solution for any area of waterproofing, surfacing and protection that we are involved in. With over 40 years of experience we have learnt never to underestimate the stress that can be placed upon a roofing system. Therefore, we only partner with manufacturers of the most advanced, well proven and durable waterproofing technology on the market, with long-term guarantees of up to 25 years. We send an occasional email newsletter with all the latest innovations, offers and case studies.